The Center for the Study of Contemporary China (CSCC) was established in 2012 at the University of Pennsylvania to advance Penn’s leadership in programs, research, and scholarship about the political, legal, economic, and social factors shaping China and its role in the world today. The Center sustains and extends the University’s work on and partnerships in China, providing an institutional home for campus-wide collaboration among departments, programs, institutes, faculty and students at Penn engaged in work pertaining to contemporary China. Activities include conferences, roundtables, and a speaker series. The Center also provides support for faculty and graduate student research and hosts visiting international scholars and prominent public leaders. Penn has long been home to eminent scholars studying China, including those in the departments of Anthropology, Art History, East Asian Languages and Civilizations, History, History and Sociology of Science, Political Science, and Sociology, as well as in the Law School, the Wharton School, and the Annenberg School for Communications. Since 1995 Penn has also had an active Center for East Asian Studies (CEAS). The Center for the Study of Contemporary China (CSCC) was established in 2012 as an institution focused on the political, social, economic, and legal factors shaping China and its role in the world today. Based in the School or Arts and Sciences, the CSCC’s mission is highly interdisciplinary and reaches across many of Penn’s Schools. The CSCC brings together faculty and students from across the University’s departments, programs, centers, and schools interested in the changes unfolding in China and China’s place in the world as its international significance grows. Recognizing the importance of China’s history and the role of fields outside the social sciences in understanding contemporary China and its interactions with the outside world, CSCC complements existing strengths in those fields at Penn and welcomes the participation of those whose work draws on China’s past to understand the present, or whose work in the humanities and natural sciences illuminates the questions relevant to the CSCC’s purposes. Ambassador Huntsman welcomed more than 250 Penn alumni, friends and parents for a reception at the U.S. Embassy in Beijing. Avery Goldstein (left) and Jacques deLisle participated in a panel discussion about U.S.-China relations chaired by Amy Gutmann and Peking University’s School of International Studies (SIS) Dean Wang Jisi. 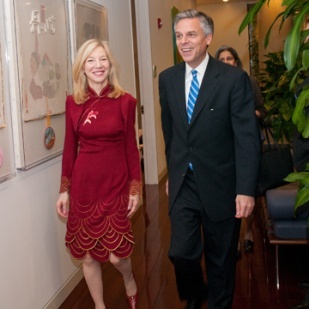 The initiative to establish the CSCC emerged in the context of Penn President Amy Gutmann’s March 2010 visit to China. Her visit, which included a diverse delegation of Penn faculty and administrators, reenergized the University’s longstanding ties to academic institutions in China and established significant new relationships. In January 2012, President Gutmann, Provost Vincent Price and Dean of the School of Arts and Sciences Rebecca Bushnell announced the launch of the Center for the Study of Contemporary China. Avery Goldstein was appointed as the Center’s founding Director, Jacques deLisle as Deputy Director and Yuanyuan Zeng as Associate Director. The Center immediately began sponsoring and supporting events at Penn relevant to the study of contemporary China, and preparing for a full slate of programmatic activities in the 2012-2013 academic year. 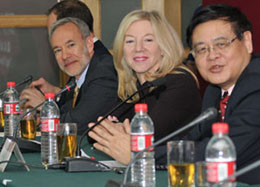 DeLisle also accompanied President Gutmann to Shanghai for a session of “Engaging Minds” program. In August 2012, the Center opened its offices in 345 Fisher-Bennett Hall on Penn’s campus, with space for the CSCC leadership, staff, visiting scholars, postdoctoral fellows, research assistants, and work study students as well as a conference room equipped with audio-visual capabilities fully integrated with the internet to facilitate web-based conferencing. The CSCC also launched a website to disseminate information about the Center’s activities and to serve as a source of information about research, teaching, activities and opportunities relating to contemporary China for the Penn community and beyond. Each year, the CSCC sponsors a rich program of speakers, conferences, policy roundtables and other activities. Highlights for 2012-2013 include presentations by experts on China’s foreign policy, economic development strategy, legal reforms, minority policies, leadership change, and relations with the United States, a conference on the array of challenges facing China today, and a public lecture by former U.S. Ambassador to China, Governor Jon Huntsman. A full, updated schedule of activities can be found here. The CSCC has more than forty affiliated scholars drawn from across five schools at Penn and provides grants to support research on contemporary China by Penn faculty and graduate students. The CSCC also hosts a distinguished group of visiting scholars, post-doctoral fellows and other experts on contemporary China. More information about this year’s visitors can be found here. For information about the CSCC’s visiting scholar and post-doctoral opportunities, see our complete description here.